Nature is stubborn, it has many resources and is surprisingly clever. In order for species not to die they need to mutate, hybridize and hibernate. They resort to aestivation and adapt to our attacks. Only the best and strongest survive. All is not lost. 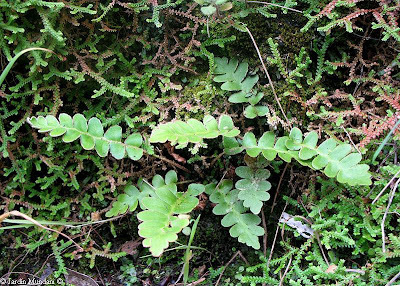 Ceterach lolegnamense fern, also called Asplenium lolegnamense, is an endemism of Madeira absolutely amazing. For its status of allohexaploid hybrid should be sterile and die without issue but managed to evade his fate and survived by two mutations that laugh at the laws of genetics, Apomeiosis or absence of meiosis in the sporangia, resulting in hexaploid spores perfectly viable and Apogamy or Gametophytic Apomixis allowing it to produce a new fern from a somatic cell of the gametophyte, skipping fertilization because their gametes are not viable. Ceterach lolegnamense in a very damp and shady wall oriented toward the northwest located on the road to Curral das Freiras. Is rooted on a bed of moss, lichen and Selaginella denticulata, which act like a sponge and keep the soil constantly moist. It is very striking resemblance to its ancestor Ceterach aureum. Interestingly, despite being endemic to Madeira, its origin seems to be in the nearby Canary Islands. Both parents, the allotetraploid Ceterach aureum (Asplenium aureum) and the allo-octoploid Ceterach octoploideum (Asplenium octoploideum synonymous with Ceterach aureum subsp. Parvifolium) only live in the Canaries. 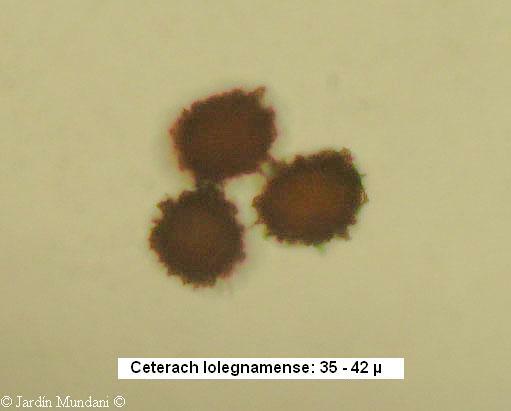 It is assumed that several million years ago, perhaps during the Messinian period of Miocene, the spores were able to get to Madeira, or carried by wind or glued to the feathers and feet of sea birds, capable of germinating on the volcanic lava populate this beautiful Portuguese island. It ignores the reasons for the extinction in the Canary Islands. 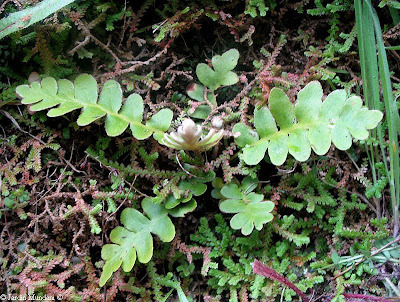 In its genome is a curious combination of chromosomes from two primordial ancestors: the 66'66% of their genes from its diploid grandfather-great grandfather Ceterach javorkeanum, also called Asplenium javorkeanum, confined for millions of years in the Italian peninsula, the Balkans, Sicily and Turkey and 33'33% from its other diploid grandfather-great grandfather Asplenium semi-aureum, now considered extinct, but their genes survive in their hybrid offspring. 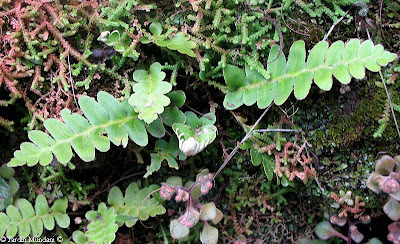 Another beautiful example of Ceterach lolegnamense in the same location as above. The thick layer of Selaginella denticulata seems to be almost essential for survival. 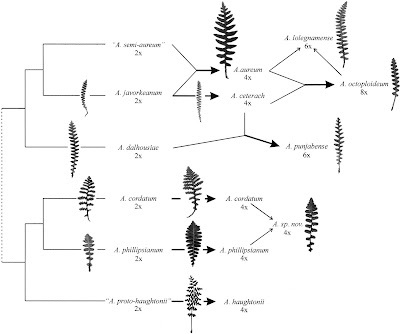 If we start a bit of substrate is to be formed by the decomposed fronds of Selaginella denticulata mixed with remains of mosses and lichens and a few pieces of volcanic lava. The Selaginella denticulata, like plants that produce the mob lives on decomposing waste itself. 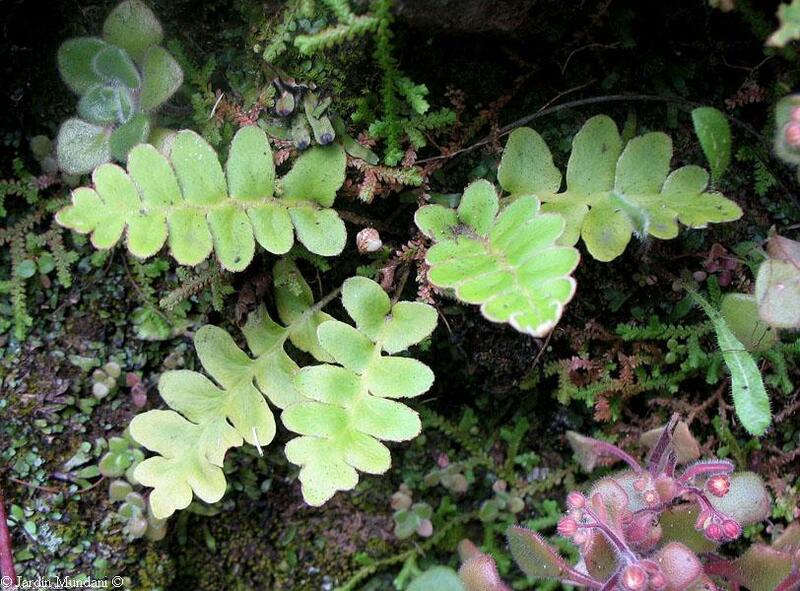 Along with this group of Asplenium lolegnamense can see multiple copies of the Macaronesian endemism Aichryson villosum, a Crassulaceae, to bloom in early May. 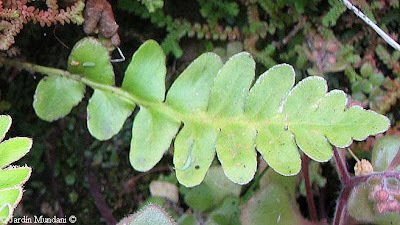 New frond of Ceterach lolegnamense in early May. The pinnae are more slender than its parent Ceterach octoploideum. Frond last year with a beautiful yellow-green, a legacy of its father Ceterach aureum. 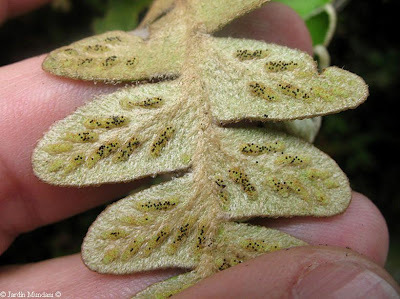 Sori still immature almost invisible under the thick layer of yellowish-white paleae lining the underside of the frond. Mature sori in early May with conspicuous black sporangia about to disperse the spores. Enlarging the picture by double-clicking the details are better appreciated. 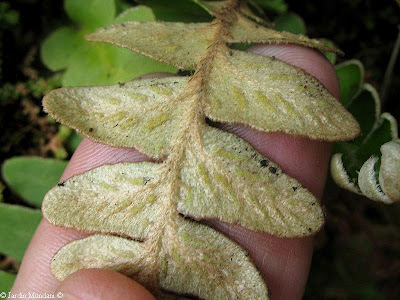 Mature sori after spore dispersal. 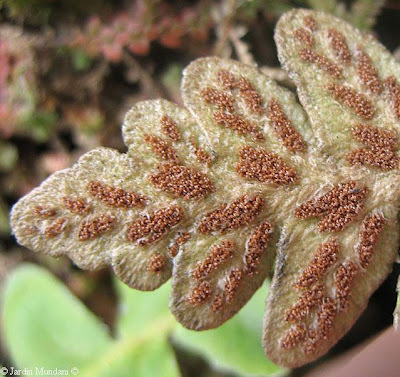 Sporangia are appreciated and made of brown, protruding above the paleae. 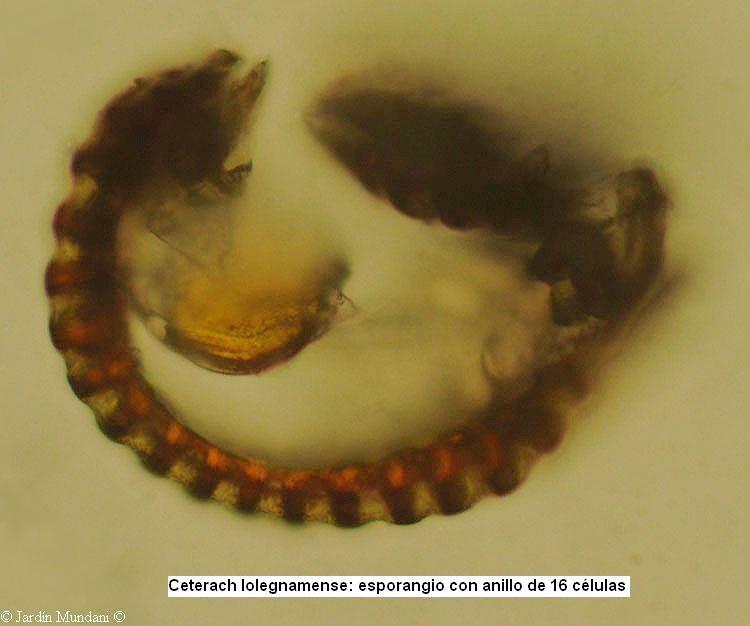 Paleae of Ceterach lolegnamense, formed by a layer of dead and empty cells. 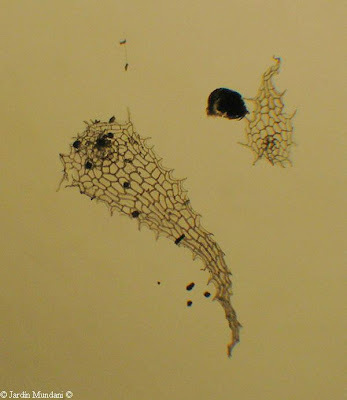 Sporangium of Ceterach lolegnamense with its ring of fire red cells and the bag ripped after spore dispersal. Ceterach lolegnamense spores of a rather large size, characteristic of polyploid ferns. 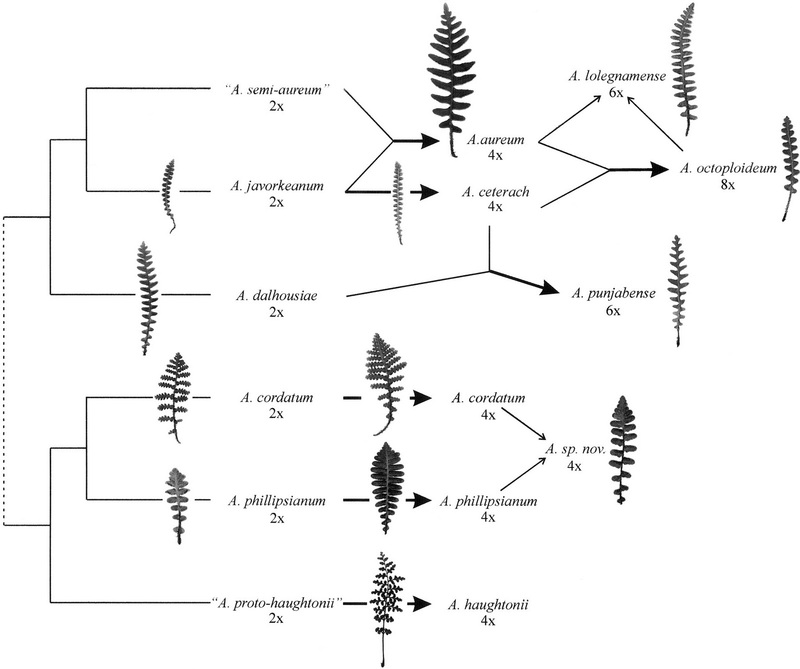 The spores of the diploid fern family Aspleniaceae never rarely exceed 39 μ, as in Asplenium javorkeanum, one of its ancestors. Evil does not exist in nature, only in the heart of man. Kiwano of the Kalahari, a delicious treat for elephants, rhinos, giraffes and ... humans.